Not everybody uses their health insurance the same way. But with so many options out there to choose from, let us help you find the plans that best fits your specific needs and budget. Buying a policy in the individual market is now a realistic option for many people. The ACA's health insurance exchanges (marketplace) in each state make it easy to compare policies, enroll in a plan and receive a subsidy if your eligible. Although, much of the media attention is on individual health insurance it is often focused on the exchanges, they are not the only option. But what about the middle income earners. Those who earn too much to qualify for help but who don't make enough money to offset the rising cost of health insurance premiums. If this is you, then your feeling the "middle-class squeeze" and it's worth shopping around and even identifying Non-ACA health insurance alternatives that could help stretch your healthcare dollars. Short-term medical (STM) is a solution designed to help with larger medical claims resulting from injuries and unexpected illnesses. When a life change leaves you without health insurance, you need coverage to get you through the transition period. Most carriers allow terms as short as 1 month to as long as 12 months at a time and renewable up to 36 months. These plans can be a smart solution for those in good health, as pre-existing conditions may not be covered. STM premiums are often a fraction of major medical premiums. For example, at the end of 2016, a short-term policy costs approximately $124 a month compared to $393 a month for a major medical plan without subsidy. Short Term Plans are available year round and are not restricted to any Enrollment Periods. A Fixed Indemnity plan allows you to receive specific first dollar payments for covered healthcare services, regardless of what your medical provider charges. This differs from traditional Major Medical plans where you must first satisfy a deductible every year before you are eligible to receive benefit payments. Fixed Benefit Plans are available year round and are not restricted to any Enrollment Periods. Going forward there are only 2 ways to get a long term Major Medical plan that are ACA compliant,so that means either going through the Public or Private Exchanges. Not all carriers are in the Public Exchange. But all carriers in the Public Exchange are also in the Private Exchange. Either way, we can assist you on both. There are Public and Private Exchanges. Public Exchanges are run by either the state or federal government. The incentive for shopping on a Public Exchange, is you could qualify for a subsidy. Private Exchanges are run by private companies instead of the government. You can shop for all different types of plans from different insurance companies. You can't get a subsidy on a Private Exchange. Maybe your not fond of shopping on a government run website and won't qualify for a subsidy. In that case, you would prefer the Private Exchange. These are run by private companies and offer plans from the same brand name companies as the federal exchanges. 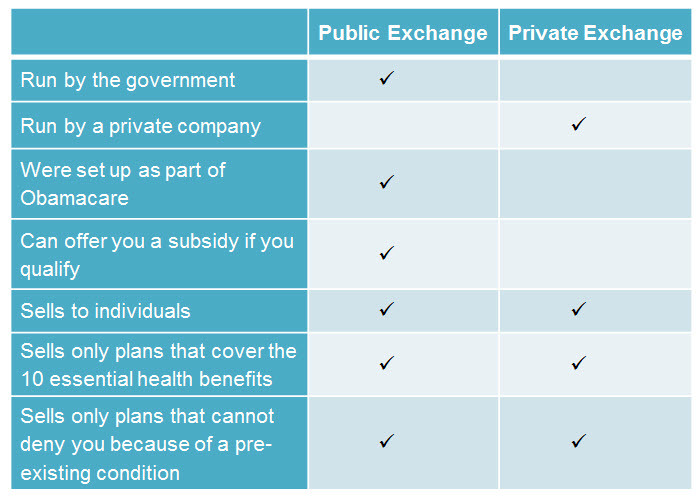 All plans on any exchange must provide certain levels of coverage and must cover the 10 essential health benefits. Healthcare.gov is where it all started for the "Public" Exchange. Sometimes you'll hear this being called the health insurance marketplace, they are the same thing. This website launched October 1, 2013 and was built and controlled by the federal government. This is a good place to start if you want to purchase insurance on government-run exchange, as opposed to a Private Exchange. Another website that has a better user-experience is Healthsherpa.com. BE AWARE: Not all plans are created equal. Not everything is based on premiums or deductibles. Networks plays a big part in not just savings but choosing which doctors and hospitals you can see or go to. DO NOT: Try to go and apply to the Public Exchange website on your own. Let us guide you through the process to avoid all the hassles and delays.